with white insulating liners that can hold 3 qts. of ice for hours. Japan. Aluminum Tankard Ice Bucket. Hand-rubbed pewter finish. Holds 4 quarts. Set of 4 pewter finish aluminumTankards. Clear glass bottom.Hold 16oz. seal of a famous German brewery. Hold 16 oz. each. From West Germany. are made of crackled glass. Each rests in its own black wrought iron stand. Ice fits into a separate compartment to chill the wine without diluting it. iron scrollwork plus its own candle and holder. Glasses not included. and bung are perched on wood stands. Both complete with six 12-oz. glasses. (8) 21 N8628-Double Keg Set. (9) 21 N8627-Single Keg Set. W ine Rock. Walnut-finished hardwood, plastic center. Holds 12 bottles. in. tall. The six glasses are each 3 in. high. ( 12 thru 15 ) Ruby Glass Stemware. With clear glass stems. Box of 4. Oval Wine Rack. Constructed from mellow pine. Holds ten bottles. Brandy Snifters • . in boxes of 2. Ruby glass. clear stem. J apan. 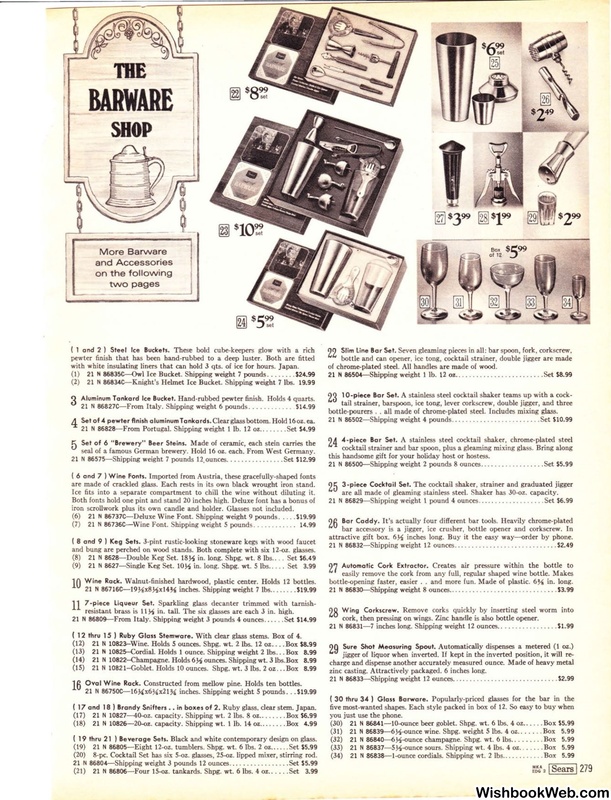 Beverage Sets. Black and white contemporary design on glass. six 5-oz. glasses, 25-oz. lipped mixer, stirring rod. (21) 21 N 86806-Four 15-oz. tankards. Shpg. of chrome-plated steel. All handles are made of wood. this handsome gift for your holiday host or hostess. are all made of gleaming stainless steel. Shaker has 30-oz. capacity. 21 N86829--Shipping weight 1 pou nd 4 ounces..... .
inches long. Buy it the easy way-order by phone. bottle-opening faster, easier . . and more fun. Made of plastic. 6% in. long. 21 N8683D-Shipping weight 8 ounces............. .. . . ... .
21 N86831-7 inches long. Shipping weight 12 ounces.. . . . . . . .
jigger of liquor when inverted. zinc casting. Attractively packaged. 6 inches long. five most-wanted shapes. Each style packed in box of 12.